Bake chocolate chip cookies per instructions on the package. Spoon ice cream onto one cookie, and top with a second cookie. Roll the sides of the cookie sandwich in a low dish with sprinkles. Store in the freezer until you are ready to enjoy them! Sandwiches. The word makes most people think of lunch. Or maybe a casual dinner or picnic in the park. Not me. I don’t think turkey on wheat or sourdough BLT. Nope, I’m thinking dessert. Only good things can happen when you replace the sandwich bread with cookies and start getting creative! Here are three of my favorite ways to make this lunch staple into a dessert masterpiece. I loooove a homemade ice cream sandwich. 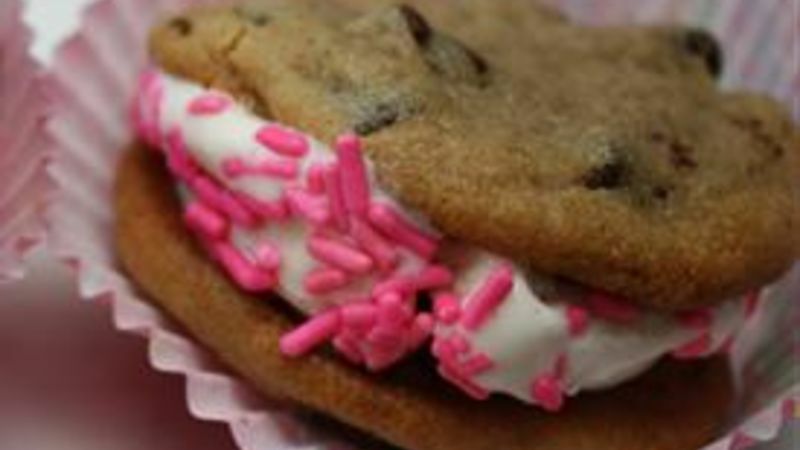 Add some splash to your sandwich by rolling the ice cream sides in sprinkles. Make ‘em up ahead of time and freeze them. I like to place each one in a cupcake liner and freeze them on a tray. They’ll be ready to hand out to your crowd at dessert time. Everyone loves red velvet cake or cupcakes. Here’s a fun twist on that favorite! These easy (made from cake mix!) cookies are yummy and cakey. And they are taste perfection when sandwiched over cream cheese frosting. In my opinion, you cannot go wrong with Nutella. I can’t be trusted around it—so of course it makes my list of sweet sandwich perfection. Two sugar cookies with a thick layer of the stuff is hard to beat. Plus the sophisticated color combo could earn these babies a spot on the fanciest of dessert tables. Sandwich cookies are a little more labor-intensive than regular cookies. So don’t hesitate to use any of the Pillsbury Ready to Bake cookies for your first step. They are quick and tasty! What are you favorite sweet sandwich combos?